UPCOMING TRAIL WORKDAYS – JOIN US! PLEASE BE A PART OF EVTA’S GOAL OF CONNECTING STONE MOUNTAIN STATE PARK TO DOWNTOWN ELKIN! Mark your calendars for Saturday, March 23rd for a trail work day. We will be working on a beautiful 3/4 mile section near Stone Mountain State Park. We will be meeting at the Stone Mountain Country Store on the Frank Parkway at 9:00 AM (just before the main entrance to the park). If you are interested in participating please e-mail Bob at bearc98@yahoo.com That way we can advise if there is a weather delay and what type of tools will be required. We should be through by noon so you can have all of the afternoon to explore Stone Mountain State Park. Also mark your calendars for Saturday, April 13th for another trail work day. If everything progresses as we hope, this workday will be at the first bridge crossing near Elkin. If not it will be in the Grassy Creek area. If you are interested in participating please e-mail Bob at bearc98@aol.com That way we can advise if there is a weather delay and what type of tools will be required. It is exciting to get 30 or 40 people for our trail work days. But there are smaller sections and projects which require smaller groups. We are establishing two regularly meeting groups to tackle these areas. One group will be meeting every second Saturday of the month for those that work during the week. The second group will be meeting the third Thursday of every month for the “retired volunteers”. Herb MacDonald will be heading these groups. Herb has 25+ years of trail construction and maintenance experience with the Appalachian Trail. If you want to help, please e-mail him at herbmacdonald999@gmail.com To begin with, the work days will probably be half days. The groups will modify the schedule based upon those volunteering. So even if you have prior commitments, but still want to get out there and build some trail, contact Herb. 4/20/13 Trail Day – Mountains To Sea Trail/Widows Creek Trail 8:30 am – 3:00 pm meet at the Backpack Parking Lot. 6/1/13 National Trails Day – Stone Mtn. Loop Trail and Wolf Rock Trail 8:30 am – 3:00 pm meet at the Upper Parking Lot. Items to bring are: pair of work gloves, lunch, water and a great attitude! Park Staff is encouraging everyone to call the office 336-957-8185 or send us an email at stone.mountain@ncparks.gov to sign up your group so we can plan our projects accordingly. If you have any questions please feel free to give Janet Pearson a call. Everyone is invited! ← Overmountain Victory Trail Talk scheduled for Thursday, January 17 is cancelled due to a forecast for heavy snow. 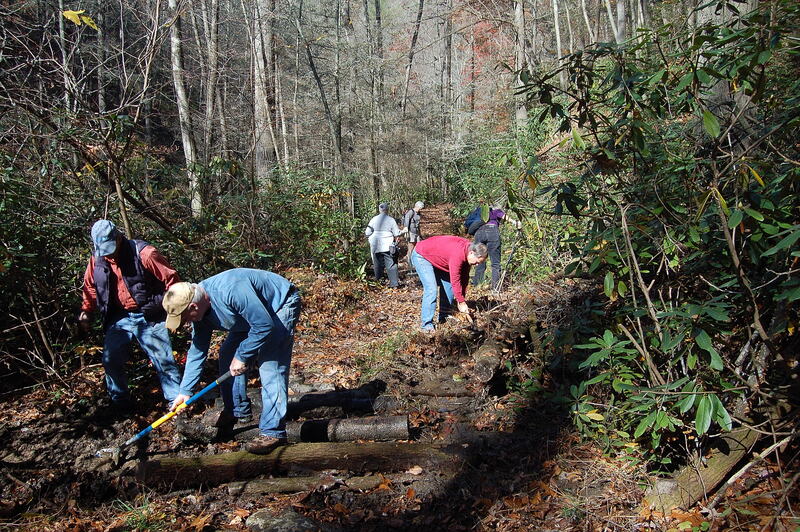 Home » UPCOMING TRAIL WORKDAYS – JOIN US!